As an employee of Methodist Health System for over twenty years, I have always understood that the people and culture are what sets Methodist apart from other health systems. Yet, I have always been on the giving side of the relationship and aside from the well checks and healthy babies, had not experienced the "depth" of "The Meaning of Care." My father-in-law, Delrae Eaton, entered the hospital on April 20 with a very complex medical history and symptoms that he had been questioning and battling for over 6 months. Methodist provided him with the best team of doctors, specialists, nurses and therapists which collaboratively were the definition of brilliance and compassion. 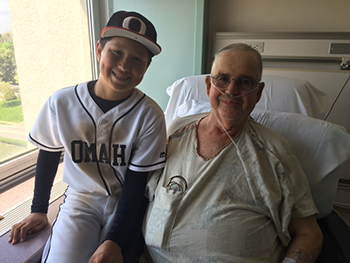 Del suffered from histoplasmosis which infected his mitral valve placing him at a highly compromised risk for surgery, but when met with the decision of hospice or courageously choosing surgery, there was no question. You see this was a man that raised five of his own children and selflessly raised two others outside of his family, loved bigger than life, and didn't want to "choose good-bye." His care team rallied around him with jokes, laughter, and prayer preparing him for this journey with an uncertain outcome and were both helpful and hopeful with our family. On May 17, Del had surgery and I still remember his nurse Ryan saying..."I'll be right here when you get back." With everyone holding their breath, he made it through surgery. The series of complications after surgery were a rollercoaster of promise and despair, but we continued to find the most genuine concern by all of the staff on 9 south and north. Delrae told me before surgery that his goal was to watch my son (11years old) play baseball again. While hospitalized, staff helped set up an ipad so baseball games could be periscoped. He also watched his other grandson graduate as valedictorian, celebrated his 55th wedding anniversary, and his 74th birthday. The staff never hesitated. Thank you Methodist for all of the care you extended to Delrae, to our family, and for never treating your patients and the care as "duties", but rather acts of selfless giving. On June 7th, with Dr. Lukas's guidance and care, we transitioned Del to hospice. As I brought my kiddos to say goodbye to the grandpa that never missed a thing...we found that Ryan had escorted our entire family and Del to the front of the hospital to feel the sun on his face one last time. You see, Del was unresponsive at this time and we certainly recognized that this was above and beyond his duties, but it was such an absolute act of caring. We lost Del in the quiet hours of the morning on June 10 after 49 days in the hospital which were filled with so many emotions which include blessings of those that made the journey along side of us. We were comforted by The Meaning of Care that was so much more than words.